12.5" RCOS @ ~f/9 (2880 mm fl) at 0.64 arcsec/pixel. Shown at 1.31 and 3.15 arcsec/pixel. 3/23/2014 to 4/24/2014 Chino Valley, AZ... with CCDAutoPilot, CCD Commander & CCDSoft, AOL guided. CCDSoft, CCDStack, PixInsight, Photoshop CS6 and Noel Carboni's actions. eXcalibrator v4.25 for (g:r) color balancing, using 55 stars from the SDSS-DR9 database. PixInsight processing includes gradient removal, initial non-linear stretching with HistogramTransformation and MaskedStretching and selective use of HDRMultiscaleTrans to enhance the detail in the center of the galaxy. 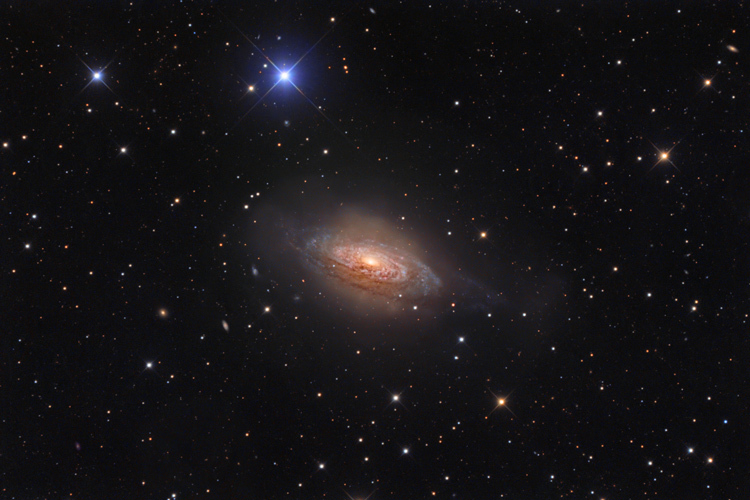 NGC 3521 is located in the constellation Leo. On the scale of cosmology, the galaxy is practically in our backyard at a distance of only 52 million light years. NGC 3521 is commonly known as the Bubble Galaxy. This is because of the galaxy's large shell, likely caused by a series of mergers with smaller satellite galaxies. Deep exposures reveal the tidal tail extending to the right. The shape of this tale could also prompt a common name of the Goldfish Galaxy.